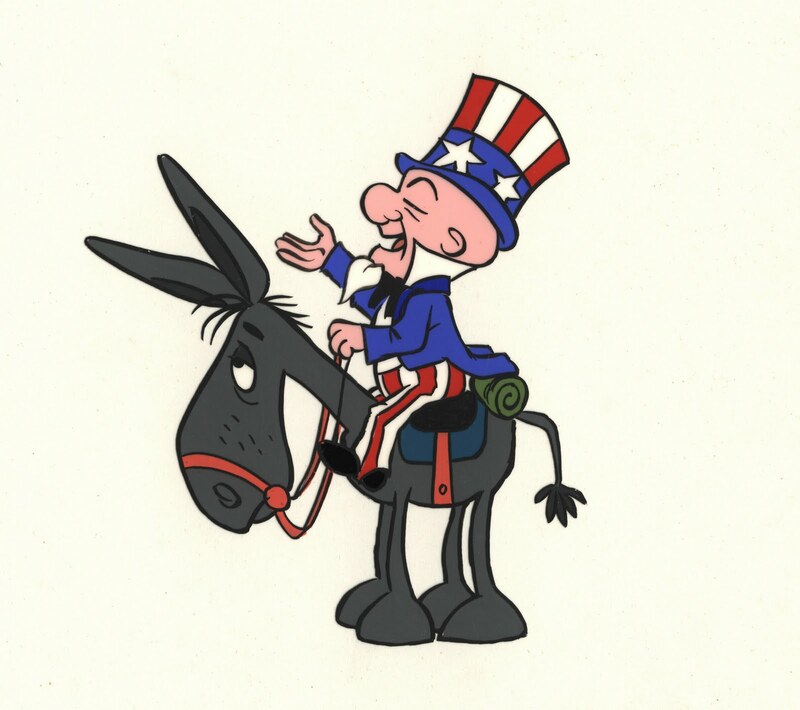 One of the films included on Shout Factory’s new Magoo on TV boxed DVD set is the 1970 NBC special, Uncle Sam Magoo, sponsored by Maxwell House coffee. Unlike Mr. Magoo’s Christmas Carol, it wasn’t Lee Orgel in the driver’s seat this time but Hank Saperstein. 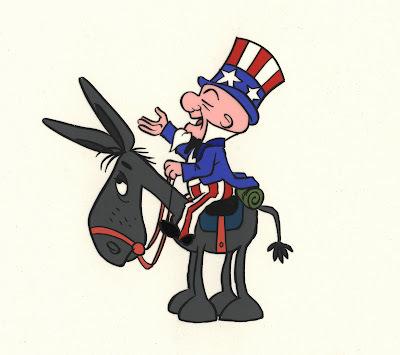 It was Saperstein’s idea to do a patriotically themed special with Magoo and, in an effort to capitalize on the previous success of Mr. Magoo’s Christmas Carol, he enlisted Orgel to produce it. Lee reassembled some of the old team from Christmas Carol including designers Lee Mishkin and Tony Rivera, director Abe Levitow and background artist, Bob Inman. 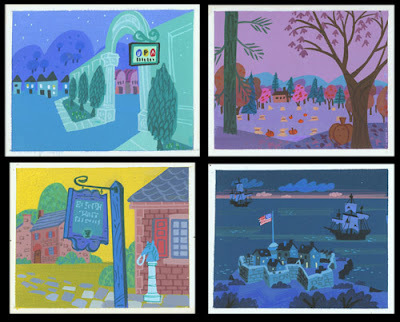 Others from Christmas Carol who contributed were Marty Murphy on storyboards, Steve Clark as sequence director, animators Hank Smith and Xenia DeMattia, background artist David Weidman and composer Walter Scharf. 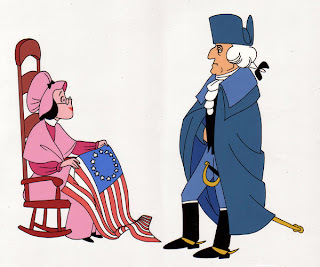 Unfortunately, the look of the film isn’t nearly as consistent as previous Magoo entries like Mr. Magoo’s Christmas Carol or even The Famous Adventures of Mr. Magoo. 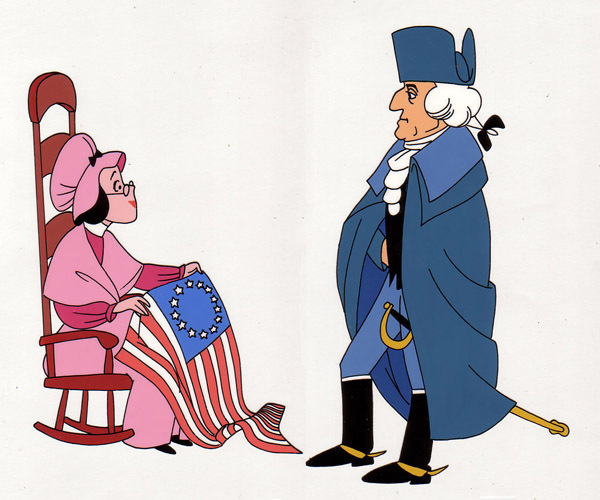 Animation design had changed a lot in the years between Famous Adventures and Uncle Sam Magoo and the design of the show feels caught squarely between the two trends. Inking cels had disappeared in favor of the faster and cheaper process of Xeroxing drawings onto cels and a certain smoothness was lost in the character delineation. Some projects benefited from the new look, others merely looked cheap. Hand inking had a way of making weak animation drawings look palatable while the raw graphic nature of the pencil line Xeroxed onto cels had a way of highlighting weaknesses. While it wasn’t entirely objectionable in this film, the Xerox line look did take some of the elegance out of the UPA TV look. Beyond the surface delineation, however, there are other design issues. The look of the characters vary, from broad cartoon styling to a more representational look, and the sequences within the film, having been done by several different artists working as freelancers, don’t always tie together well for the same reasons. One area that seems to be more consistent is the color styling, which was keyed by only one artist, Bob Inman, in pre-production. Below are some of Bob’s thumbnail keys for the special. 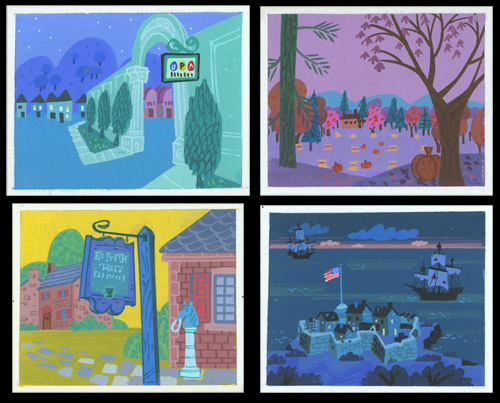 Original art from the special is available at Van Eaton Galleries, to see it click here.